Good fiction should open us to new ideas and ways of approaching life as seen through another’s words, and great fiction also demonstrates how to exploit language in an artfully constructed story. I think Shakespeare and Faulkner are considered great writers by achieving such high levels in these regards. Although works of non-fiction should be held to similar high standards, seldom is it found. 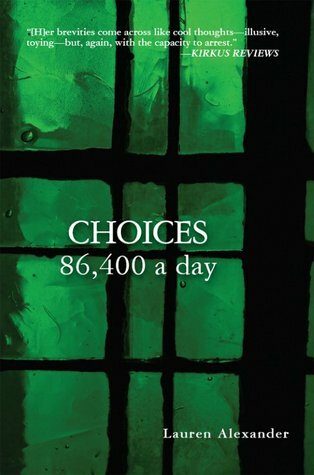 Alexander’s book, Choices, 86,400 a day, illustrates that it can be done.Words of wisdom sometimes can be clever, but not particularly enlightening or helpful: “early to bed, early to rise ...”. Others can succinctly, but prosaically, guide us in the right direction like a road sign: “begin with the end in mind”. Alexander has raised the bar for books of aphorisms by using imagery and poetic language to put an unusual spin on events that occur in everyday life. I was frequently caught off guard by the direction she would go with her observations, with simplicity and profound depth being demonstated in a crafty manner.This is a must-read book that is enlightening but also enjoyable to read. You will be going back to reread it over and over again. EDITORIAL REVIEW: Refinements and distillations on the theme of awareness....epigrammatic....provocative...mordant....with the capacity to arrest…. An often-sparkling show of what in life can be gathered and given an aphoristic squeeze by keeping your eyes and mind open. --KIRKUS REVIEWS "The World's Toughest Book Critics"
I highly recommend this book for everyone of all ages--readers and non-readers. A page-turner with observations that get right to the point No fluff. A new breed of a food-for-thought kind of book. A book to read and re-read. There's something to take with you every time you open this book. I open it at least once a day and take a random jewel to think about. Wow! Alexander has a way with words. What she writes and how she writes--phenomenal. I'll keep this book at my fingertips.